Having already published lists about the physically strongest characters in the Marvel and DC universes, we thought it only fitting to look at characters from the same comic book companies whose strength is measured in a completely different way – and we’re starting with your friendly neighborhood Marvel characters! Characters with esoteric abilities are just as prominent in comics as those with the physical might to move moons and those abilities can come from a variety of sources. For example, the Silver Surfer gets his vast array of powers and abilities from “the Power Cosmic,” Thanos’ powers are augmented via the use of advanced technology, and countless characters get their powers from the mysterious world of magic – and it’s magic we’ll be focusing on here. It’s not exactly a simple task to quantify magical powers – after all, it’s not as if there’s a magical equivalent of a weight scale to measure them – but this article will give it a damn good try! Here are ten characters from Marvel Comics whose magical power puts them amongst the most powerful in the Marvel universe (note that this list will avoid the utterly incalculable and boring god-like characters – as well as the mystical entities that sorcerers invoke to perform spells – in order to focus more on those characters who had to learn their magical craft the hard way. In other words, don’t expect to find the likes of Cyttorak, Shuma Gorath or the Vishanti here). 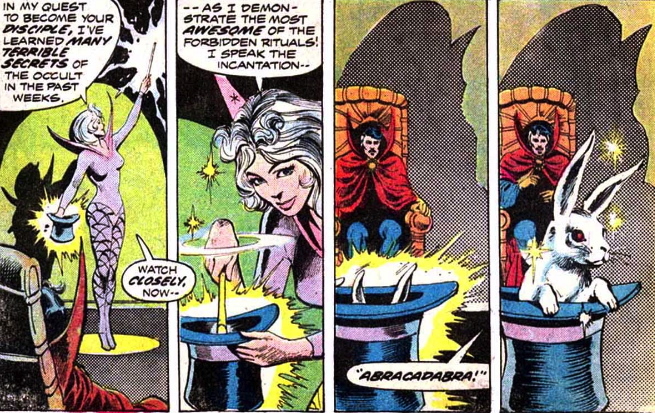 Clea (first appearance: Strange Tales #126, November 1964) is the daughter of the powerful sorceress Umar, the niece of the Faltine sorcerer Dormammu, and the lover, wife, disciple and sometimes foe of magical hero, Doctor Strange. As a result of those connections, she is an extremely adept and powerful sorceress in her own right. In spite of her inherent mystical nature, it is mostly the teachings of Strange that have led to her mastery over magic, resulting in powers including teleportation, telekinesis, the expulsion of magical energy blasts and mind-controlling abilities. Some of her most impressive specific feats of power include adorning the powerful Flames of Regency (which represent her ruling over the Dark Dimension), invoking powerful entities like the Seraphim and Krakken (to protect herself and entrap opponents respectively) and… erm… pulling a rabbit out of a hat (just kidding about that last one!). Brother Voodoo AKA Jericho Drumm (first appearance: Strange Tales #169, September 1973) is a Haitian who travelled to the United States to work as a psychologist. After returning to Haiti and discovering his brother Daniel was dying as a result of a voodoo curse, Jericho studied under Daniel’s mentor – Papa Jambo – to become a powerful sorcerer himself. He became an accomplished voodoo practitioner and learnt various magical powers, including the summoning of spirits, hypnosis, the ability to mystically conceal himself and control over the elements. 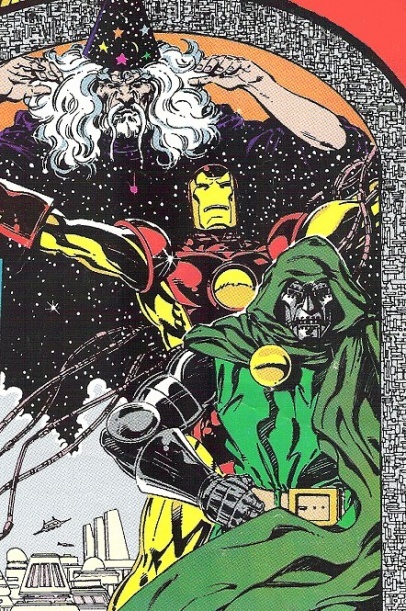 Some of his more specific impressive mystical feats include becoming the Sorcerer Supreme (and consequently being renamed Doctor Voodoo), fighting a month-long war to kill every magical being on Earth, being able to control all living things, overriding Doctor Doom’s* technology with his magic and having his body mystically augmented by the spirit of his sorcerer brother, giving him the ability to beat zombies up with his bare hands. *A special mention should actually go to Doctor Doom for almost making it onto this list for his magic prowess, in spite of his main speciality being science/technology. Very few characters in all of fiction have such mastery over both. 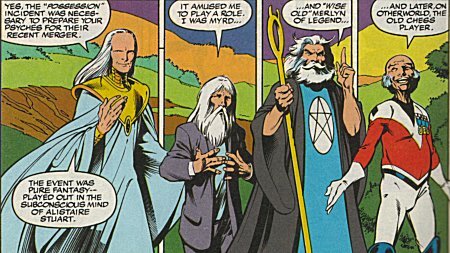 Modred the Mystic (first appearance: Marvel Chillers #1, October 1975) is a powerful sorcerer who has been depicted on panel as both an anti-hero and an outright supervillain. He gained his power from the mystic tome known as the Darkhold – first by learning the spells within it and then by exchanging his soul for a contract that imbued him more intrinsically with its power. As a result, Modred has vast control over the forces of magic, which gives him an abundance of abilities like manipulation of the elements, flight/levitation, the ability to erect powerful mystical barriers and the expulsion of magic ala energy blasts for offensive purposes. 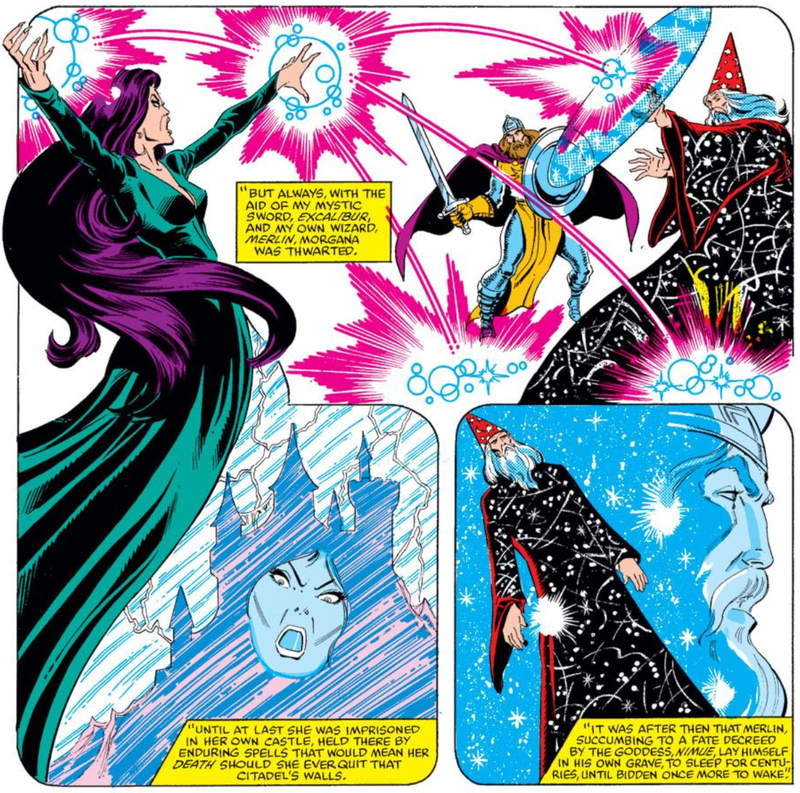 His most impressive specific feats include being able to cast the powerful Crimson Bands of Cyttorak, raising an army of dead warriors with one casual magic blast, and mind-controlling a Phoenix host while he was in a completely different dimension to her. Umar (first appearance: Strange Tales #150, November 1966) is the mother of the aforementioned Clea and the sister of Dormammu. She is a villainous member of the usually energy-based Faltine species who is trapped in human form, but who still possesses powerful mystical abilities in spite of that handicap. Those aforementioned abilities include time travel, alteration of her size, the conjuring of powerful beings that she can animate at will, the casting of illusions and somewhat limited mind-control. Her most impressive specific feats of power include holding both Hulk and Red She-Hulk in place with tongue-shaped energy constructs, invoking powerful entities like Cyttorak and Bishru (to entrap and blast opponents respectively) and, bizarrely, being frivolous with the Hulk – in spite of her slender build and the evident disproportion between the pair – and not being tired, satisfied or remotely hurt, while leaving him exhausted (and yes, that really should be considered quite the achievement in terms of power, as she would have to be very durable to endure the encounter, let alone hardly have it affect her)! Given the popularity of the iconic character in the Marvel Cinematic Universe, Loki needs no introduction. However, the comic book version of the character (first appearance: Journey into Mystery #85, October 1962) is considerably more powerful than the live action counterpart played by Tom Hiddleston. The son of the Frost Giant Laufey, Loki was abandoned due to his abnormally small size and adopted by Laufey’s sworn enemy – the Asgardian All-Father, Odin. He is superhumanly strong and durable – characteristics he has also augmented with his magic – and can manipulate magic for a number of outcomes, including the casting of illusions, shapeshifting, teleporting (including through dimensions) and the expulsion of energy blasts. His most impressive specific feats include mind-controlling his strong-willed adoptive brother Thor, switching bodies with Thor (enabling him to lift Mjolnir, nonetheless), doubling the powers of other characters and transmuting Kang the Conqueror and Mantis into energy before absorbing them into himself. Baron Karl Amadeus Mordo (first appearance: Strange Tales #111, August 1963) is one of the foremost adversaries of the heroic Doctor Strange. Having gained an interest in magic from his grandfather, he became the apprentice of the Ancient One (in spite of the fact that his powerful mentor knew that gaining power could corrupt him). When Stephen Strange began studying under the Ancient One as well, Mordo grew resentful and became a villain. He boasts an impressive array of powers that include astral projection, time manipulation, energy manipulation, teleportation and control over the elements. 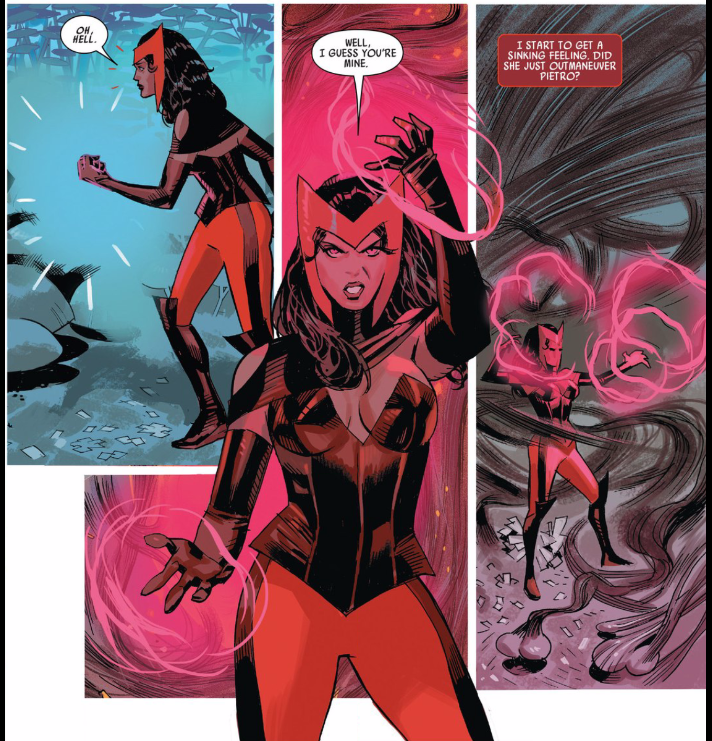 Mordo’s versatile power-set has enabled him to steal power from Doctor Strange himself in order to exile the hero to another world, briefly hold his own against Strange and his avatars, move between worlds using mirrors, fight on another plane of existence while his body remains on Earth and drain energy from beings as powerful as M.
The Scarlet Witch AKA Wanda Maximoff (first appearance: The X-Men #4, March 1964) is actually a mutant whose inherent power is the ability to manipulate chaos magic for a variety of effects. 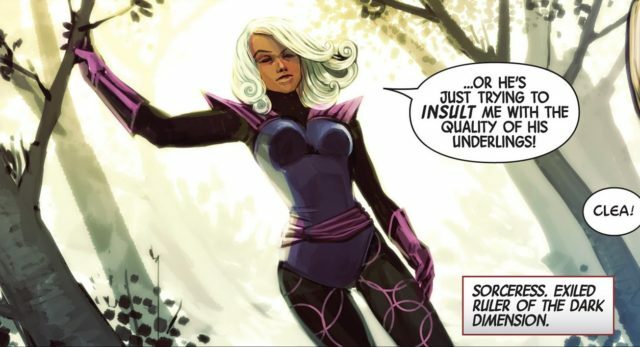 Classically the daughter of Magneto (though this has been retconned) and sister of Quicksilver, Wanda is considered to be one of the most powerful mutant characters in the Marvel universe. Her powers are known as “hexes” and they give her the ability to change probabilities and even alter reality itself. This has enabled her to produce all kinds of magical effects, including force field projection, the casting of illusions, levitation/flight and astral projection. Some of her greatest feats include taking Ultron out with one blast, outmanoeuvring her super-speed brother Pietro, transmogrifying Thor’s lightning, beating back the Phoenix Five and even defeating the Dark Phoenix alongside Hope Summers. At her most powerful, she was even able to wipe most of the mutants from the world (lessening their numbers from millions to a mere few hundred) simply by saying “No more mutants”. Marvel’s take on Merlin AKA Merlyn (first appearance: Young Allies #11, March 1944) – arguably the most famous wizard in all of fiction – is every bit as powerful as the classic depictions of the character. In Marvel Comics, “Merlin” is more of a title and a gestalt/composite of the various characters that have used the name. He has actually appeared relatively sparsely in comparison to most of the other characters on this list, but he is undoubtedly one of the greatest sorcerers in Marvel Earth’s history and essentially possesses divine magical powers. His abilities include the casting of illusions, shapeshifting, force field erection, precognition and practical immortality. Some of his notable on-panel feats of power include granting superpowers to the likes of Captain Britain, effortlessly switching between forms, expelling magic users as powerful as Morgana Le Fae and shunting Iron Man and Doctor Doom to an alternate future. Doctor Stephen Strange (first appearance: Strange Tales #110, July 1963) is Marvel’s most well-known sorcerer and undoubtedly the most popular comic book character on this list. The most prominent holder of the Sorcerer Supreme title, Strange initially sought out magic as a means to fix his paralysed hands – as his career as a surgeon had been destroyed. The Ancient One took him under his wing, made him his apprentice and taught him the mystic arts, granting Strange – in his classic form at least, as he notably fluctuates in power – abilities like astral projection, force field projection, levitation/flight, the casting of illusions and cosmic awareness. 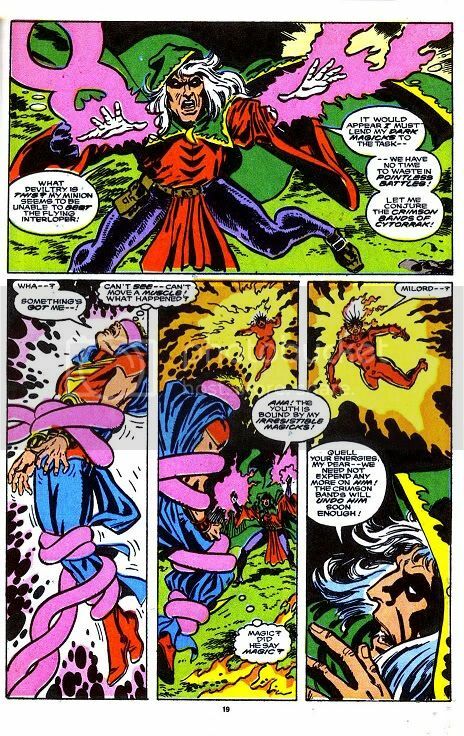 Some of his most notable feats include invoking powerful beings like Raggadorr and Cyttorak (to protect himself and entrap opponents respectively), holding his own against Adam Warlock while Warlock was wielding the Infinity Gauntlet, breaking restraints put in place by the Living Tribunal and defeating the In-Betweener. Dormammu (first appearance: Strange Tales #126, November 1964) is a member of the powerful Faltine species – the same as his sister Umar, but without the limitations of being stuck in human form. He is the rightful ruler of the Dark Dimension and an incredibly powerful and extremely evil sorcerer. As a Faltine, he generates an energy known as the Flames of the Faltine, which has been used to bring entire worlds to an end, but he is also skilled in various other magical abilities like traversing dimensions, necromancy, force field generation, time manipulation and full-on reality manipulation. A few of Dormammu’s demonstrations of great power include invoking Cyttorak to cast the Crimson Bands around a whole city (which is much further than anyone else ever has done it), defeating an army of powerful heroes (including Doctor Strange) with a mere gesture, being able to completely shrug off a physical beating by the Defenders (Hulk, Silver Surfer, Ghost Rider and Doctor Strange), mystically sealing the cosmic entity known as Eternity and flat-out overpowering a host of the Phoenix Force.